Insurance is the ultimate trust product. Customers pay insurers money for a promise that if a “bad” event occurs then the insurer will make good on that promise. Often customers pay money to insurers for many years without calling on that promise. Back in 2001 the failure of the largest general insurer at the time – HIH Insurance – raised questions about whether customers’ trust in insurers to make good on all those promises was well placed. Since the failure of HIH (and the subsequent Royal Commission conducted across 2002 and 2003 into the cause of its failure) a key focus of regulators and companies has been on financial security and the ability of companies to meet valid insurance claims. In the 17 years since the HIH failure, insurance industry capital has climbed significantly higher, there are vastly superior risk management functions, governance frameworks and pricing disciplines. The actuarial profession has been an important part of these developments with the number of actuaries working in general insurance increasing from less than 100 at the time of the HIH collapse to almost 1000 currently. Also, it is clear from the statistics that financial security in the industry has been built through greatly improved profitability with an average Return on Capital of 16% in the 17 years since HIH’s collapse compared with an average of 7% for the preceding 17 years. Yet despite this additional financial security, our trust in financial institutions (including general insurers) appears to be at an all-time low. Trust across all types of institutions – Government, Business, Media and Not for Profit – has fallen in Australia for the last two years according to the 2018 Edelman Trust Barometer (a global survey across 28 countries). Australia’s overall trust index of 40% is only 4 points higher than Russia at 36% and Financial Services is the second least trusted industry in Australia with a trust score of 49% (only Energy at 39% is lower). There have been an astonishing 73 inquiries into the finance sector in recent years with the banking, superannuation and financial services industries (including the general insurance industry) under scrutiny most recently from another Royal Commission – this time focussing on ‘conduct’. It appears that while the focus of regulators and companies has been on financial security, the attitudes of customers and community expectations of our financial institutions have been changing. That we have moved from an environment of caveat emptor (let the buyer beware) to caveat venditor (let the seller beware) is clear from the inquiries by the Productivity Commission into competition in the Australian Financial System, ASIC into the sale of add-on insurance and warranties through car yard intermediaries, ACCC into the supply of home buildings, contents and strata insurance in Northern Australia as well as the latest Royal Commission. One piece of good news for the general insurance industry is that it has not been the main focus of the Royal Commission. At the time of writing, of the 10,140 submissions received by the Royal Commission the top 3 industries were Banking (61%), Superannuation (12%) and Financial Advice (9%). However, general insurance industry practices around the sale of low value ‘add-on’ products were already well and truly in the spotlight even before the Royal Commission. The ASIC criticisms of add-on insurance included that less than 9% of the $1.6 billion of premium received over three years was paid out in claims, whilst car dealers earned four times as much ($602 million) in commissions and consumers were often paying for products they did not need or would not be eligible to claim for. CBA refunded $16 million to 140,000 people sold add-on credit protection insurance in August 2018 after refunding $10 million the previous year. QBE, Allianz, Suncorp and Swann have refunded an estimated $120 million to over 200,000 customers who bought various add-on insurance through car dealerships between 2011 and 2017. While serious, this is nothing compared with the UK situation where banks and insurers have so far refunded GBP30 billion to purchasers of “worthless” payment protection insurance. The current environment also raises an interesting question about the role of actuaries and how far it goes in relation to protecting customer interests. In general insurance, actuaries have focused on financial security and in the FCR are concerned (amongst other things) with whether capital and premiums are adequate. Do general insurance actuaries need to consider taking a broader view of ‘customer interest’ in light of changing community expectations for our large and important institutions? Do they need to highlight or challenge where premiums may be ‘too’ profitable or products of potential low value to customers? For the actuarial profession there are questions here of a fundamental nature. Going back many decades the role of actuaries in both life insurance and superannuation had a substantial responsibility in overseeing equity among policyholders/members and also between the beneficiaries and the owners of the business. While this component of the actuarial role may have reduced somewhat in those industries it is still clearly present. In general insurance, in contrast, this has never been part of the mandate of the actuary – perhaps it will become so in future. Estelle is a Plenary Speaker at the upcoming General Insurance Seminar. Tickets on sale now. 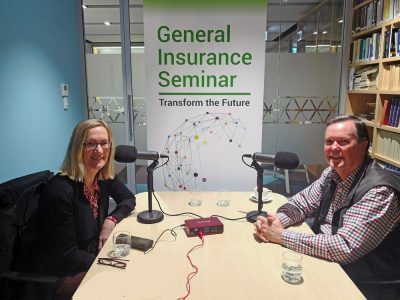 In a recent podcast interview with Tony Coleman, Estelle shared unique insights from her time as the actuarial expert to the HIH Royal Commission, drawing lessons for the current Royal Commission. Estelle is a Principal and Managing Director of Finity Consulting and 2015 President of the Actuaries Institute. Prior to joining Finity in 2005, Estelle was a partner at Trowbridge Deloitte for five years, following seven years as a Principal at Trowbridge Consulting and having held consulting roles in both Sydney and the United Kingdom. Estelle has more than 20 years of general insurance experience and has worked with a large number of clients from both the private and public sectors over the years on a diverse range of issues, both actuarial and strategic in nature. She holds a number of Appointed Actuary and External Peer Review Actuary positions.